When your sewer lines aren’t working efficiently because of clogs or other issues, look no further than the sewer repair services offered by our team here at NuFlow St. Louis. Our services will meet all of your requirements, and no matter how damaged your sewer lines, we will be able to fix them with our excellent solutions and advanced technology. In Town and Country, our sewer repair services are available for all of our customers in the community, ensuring that their problems are addressed quickly and with professional and friendly customer service. At NuFlow St. Louis, we have proudly moved away from using the traditional method of sewer repairs, in which trenches as long as the sewer lines themselves needed to be excavated on the property in order to access the pipes before any repairs could be made. This excessive labor caused needless amounts of damage and reduced the value of homes, and because of it, we offer less-expensive, more practical solutions. Our processes won’t take weeks to complete, because our work can be finished within a single day, allowing our sewer repairs to be truly effective and versatile solutions for any situation we encounter. 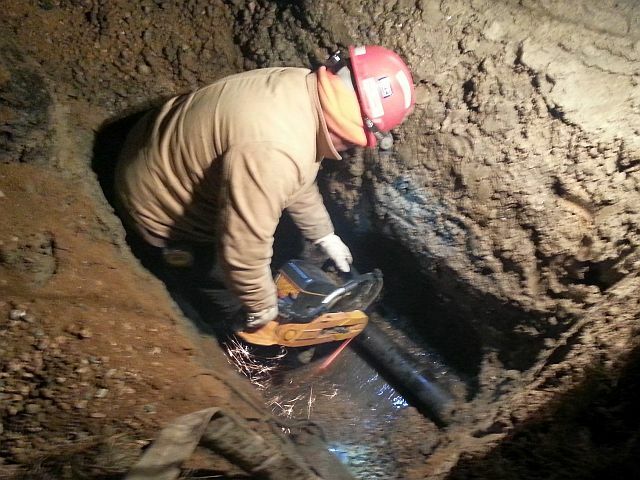 Our team at NuFlow St. Louis has developed our own technology to reduce reliance on digging trenches and instead perform repairs completely from within the pipelines. Whether this occurs in the form of trenchless pipe lining or trenchless pipe bursting, our team is trained to perform trenchless-based sewer repairs that use highly advanced equipment, materials, and allow for an easier and cheaper alternative. An important component of our work is an epoxy resin that is applied to the inside of your pipes and given a few hours to harden completely. This allows leaks and cracks to be eliminated and sealed away, and forcing the old pipe out of commission without needing to forcefully remove it from the ground. Once this is finished, the new pipe has an expected lifespan of fifty years or more, solidifying it as a reliable pipeline material that will resist environmental influences such as tree roots while also being smooth and jointless, preventing the formation of clogs and waste accumulation from within as well. With all of these benefits, our sewer repairs have evolved to become more convenient and practical for our customers while fully addressing the issues at hand. NuFlow St. Louis was established in 1998, and since then, our company has grown on the foundation of customer satisfaction and excellent work ethic. Our lining methods have been in the industry since 2000, and we strive to continue developing new technologies to advance our work and continue helping our customers solve their pipeline problems while adhering to their budget and time constraints as needed. We never stop seeking better solutions for our customers and ensuring that the results are long-term and save you money. When you need fast sewer repair services in Town and Country, don’t hesitate to call our staff at NuFlow St. Louis for your needs. We will arrive equipped with all of our equipment and tools to ensure that the problem is eliminated quickly and efficiently.